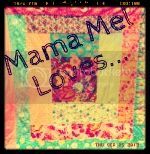 Mama Mel Loves...: Quilt Number 5 Completed! Here's the back. I like adding a little bit of the front design on the back, so I added some leftover blocks I had. Then I found this idea for rock pockets! 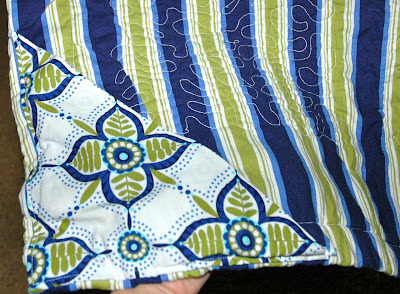 Since I knew I was going to take this quilt to the beach, or on a picnic, I figured the rock pockets would be a great addition to help keep the quilt down in case it is windy! 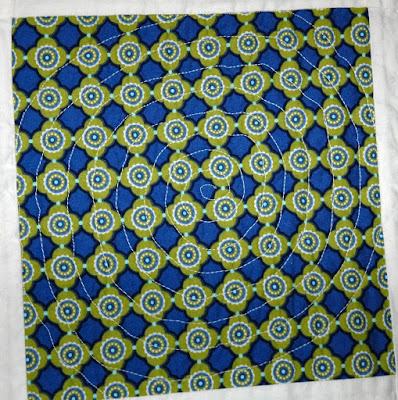 This was my first time trying my hand(s) at free-motion quilting (man, were my arms sore after this!). I recently purchased a darning foot for my machine and tested it on mini quilt sandwiches before I started on the big quilt. Since this is going to be our family quilt, I wasn't worried about messing up too much. I also used the blocks as "practice blocks" so I could try different things as I was getting used to free-motion designs. Here is my version of "meandering" or stipple quilting. I also saw this idea, and thought it would be so fun to quilt our "handprints" on our beach quilt. 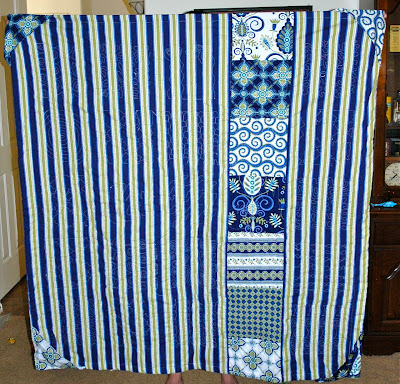 Again, I tried it out on another small quilt sandwich before I did it on the big quilt. It was a little more difficult, but not too bad. I cut out our traced hands on parchment paper, then pinned them to the quilt where I wanted them. I then quilted around the paper. If you accidentally sew through the paper (as I did), don't worry. It easily pulls away from the stitching since the needle perforates the paper. :) The above handprints are mine and my son's. I tried a few different designs on different blocks. Here is a big spiral/coil. 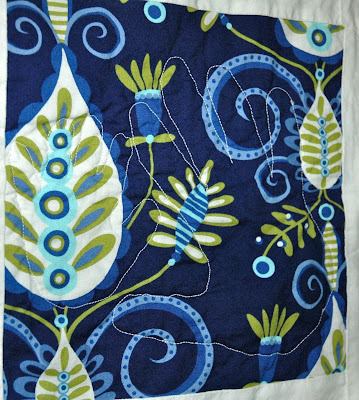 I didn't feel like using a bunch of patterns, or drawing on my quilt beforehand, since I really just wanted to get used to the feel of free-motion quilting and see what works best for me. I also did some "outline" quilting of some of the blocks with bigger prints on them. 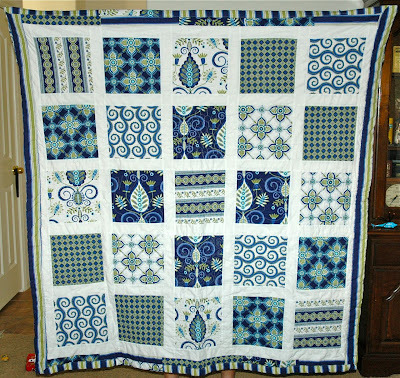 I made another doll-sized quilt in April, available in my Etsy shop. I currently have 5 quilts in progress right now. 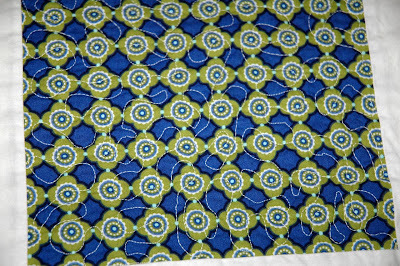 Three quilt tops are done, one quilt is sandwiched and in the process of being quilted, and two other quilt tops are started. 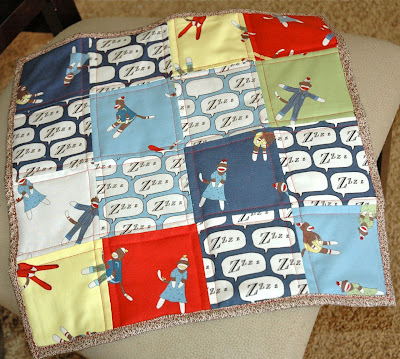 I am also participating in Craft Hope Project #7, beanbags! 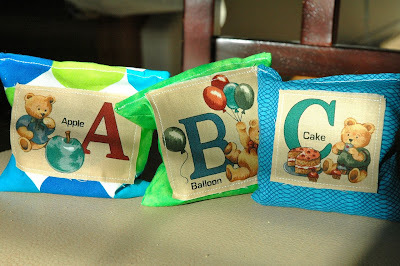 I'm making alphabet and number beanbags using a panel of letters and numbers, and some leftover fabric from my son's quilt. I thought these little bears were cute, and they teach words as well as letters. The beanbags will be helping to teach orphaned kids in Liberia. If you want to help out, the deadline is May 15th (fast approaching). You can find all the info needed here, or at www.crafthope.com. I also have a beanbag tutorial here.